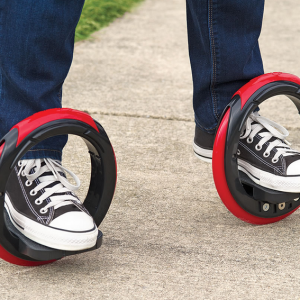 The Sidewinding Circular Skates featured in the Hammacher Schlemmer catalog is a “skateboard” the likes of which you’ve never seen. It’s actually not one board, it’s two 10-inch wheels with a platform inside the wheel to put your feet on. The rider gains momentum via “a Segway-like propulsion by leaning side to side.” To brake, you put your toes to the ground. They do come with a stick if you’d like to keep the wheels together in a more traditional skateboard-like fashion (they say it makes it easier while you’re learning). Last I looked, these were sold out, but it looked like you could get on a waiting list. Sure, Google stopped selling its fancy glasses in January, but that doesn’t mean the story of Glass is over. The executive chairman of Google said this week that Google Glass was handed over to Tony Fadell, of Nest thermostat fame, to “make it ready for users…it’s a big and very fundamental platform for Google.” So, rumors of Google Glass’ demise have been, apparently, overstated. Time will tell just what the future brings. Next month the Fitbit Surge is scheduled to get an update letting cyclists track their rides. The Verge reports that it will come in April and will track distance, duration, average speed, heart rate, and calories burned on bike rides. In other good news, Fitbit is also adding support for multiple trackers per Fitbit account. So, if you want to wear your One with your dressy clothes you can…instead of wearing your more clunky Charge HR or Surge (woohoo! I’m excited about this 🙂 ). I spotted this on Gizmodo this week and thought it was interesting because it’s a creative take on an existing product (I’m not saying it’s necessarily good, but you’ve got hand it to the creators for thinking outside of the box). The KidRunner is a jogging stroller you pull behind you when you run, rather than pushing. It can fold up into a 20” x 32” space when packed up, it weighs 20 pounds, and lets the parent run with their kid while keeping a natural stride. They’re still trying to launch the product, and admittedly it looks a little bouncier than a jogging stroller, but that could actually be a feature, honestly (maybe your cranky baby will sleep!). You can check it out (including a video) on their website. This week at the annual FacebookF8 Developers Conference, Mark Zuckerberg announced all kinds of new stuff. Facebook Messenger is going to be updated in a big way so it’ll more integrated into other apps. He introduced a software developer kit for web-connected devices—in other words, Facebook is jumping into the “Internet of Things.” And also, taking on YouTube, Facebook will now let content creators embed Facebook videos in other websites (just like people can put videos on YouTube but embed them in places like this blog). In other news, Facebook is also apparently in talks to host content from news sites, rather than making users click out to external sites. The co-founder of the company makes an interesting point. He says that current “3D printing” deserves to be in quotes because it’s not—it’s actually like ink printing….just doing it over, and over, and over again. The White House has made a landmark new hire. They’ve managed to nab Goldman, a Google vet, and an “early product mastermind at Twitter and Blogger” to be the first Chief Digital Officer. Goldman is quoted as saying his new job, “will be to help create more meaningful online engagement between government and American citizens.” All politics aside, I find the creation of this position fascinating only because it’s a clear reflection of what’s happening in the U.S. with technology and culture. History lesson: Stephen Early became the first person to officially hold the title of Press Secretary in 1932. Prior to this time, the presidents’ private secretaries often pinched-hit the job of handling the gradually increasing amount of reporters and press focused on the White House.